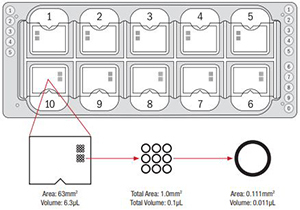 White glass, specifically designed and optimized for use with ink jet slide printing instruments. 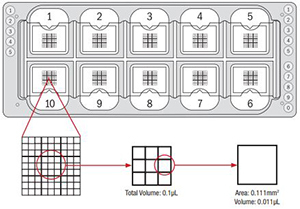 Print quality exhibits high resolution bar codes and alphanumerical characters for efficient and error-free scanning. 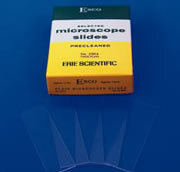 Our microscope glass slides are precleaned and are made from clear-white glass. 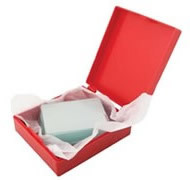 They are individually inspected and free from moisture, dirt, and film. 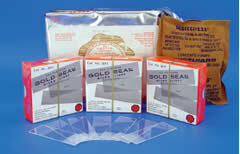 All of our slides are flat, uniform, durable, and cellophane wrapped. Designed specially for the Sysmex SP-100 slide prep unit and recommended for the Diagnostics. The 45 degree clipped corner slide offers exceptional cleanliness and resistance to sticking. The tight tolerances for the length and width help to reduce accumulation of glass chips within the instrument. The pre-cleaned slide is 25 x 75mm and approximately 1 mm thick. Ideal for technicians, who routinely prepare large number of slides. 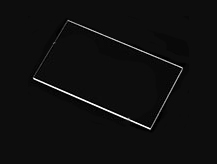 In addition to our comprehensive collection of glass slides manufactured by ESCO we now carry large glass slides which are available in 75x38mm and 75x51mm. These slides are precleaned, individually selected and are suitable for large specimen sections, such as, brain tissue. 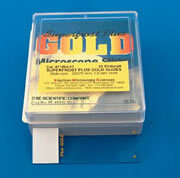 We proudly introduce GOLD SEAL® microscope slides for your convenience. UltraStick™ (adhesion coating: APTES, 3-Aminopropyl Triethoxysilane) – Adhesion coated micro slides- one of the best from GOLD SEAL® are ideal for histological and cytological applications demanding superior specimen-to-slide adhesion. The enhanced silane coating eliminates tedious procedures and special additives to your water bath. Permanox™ is a strong, biologically inert material resistant to non-chlorinated hydrocarbons, acetone, and other EM reagents. Permanox™slides allow you to do cell fixation and staining on the slide; they can be cut with scissors. Permanox™ has not been shown to be autofluorescent. All of the microscope slides are 1" x 3". Laser Capture Microdissection – Excell™ gives you the advantage of excellent tissue adherence of all tissue types, yet it easily releases those area of interest identified for Laser Capture Microdissection. 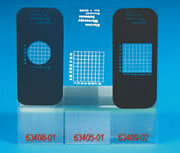 Convenient Pre-cut, twin adhesive well stickers (1cm diameter) firmly adhere to microscope slides. Examine specimens with or without cover slips. Available in depths of 0.25 mm and 0.50 mm. 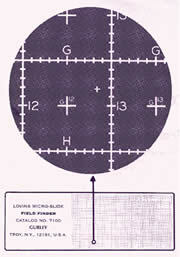 The grid measures 2 mm square-16mm total. Numbers 1-8 and alpha A-H.
"PTFE" Printed Slides, are extremely hydrophobic, acetone proof, chemical resistant and autoclavable. They are perfect for controlling cross-contamination in staining, immunolabeling and immunofluorescence tests. All printed slides are precleaned. The well surface is 100% wettable, which enhances cell attachment and increases its spreading capabilities within the well. These slides minimize the use of expensive purified antigens and antibodies. The slides measure 3 x 1" (76x26x1mm).